To stash or not to stash, that is the question?! And others, would you believe, do not keep any left over fabrics!! I have to admit, sometimes I fall into that category. If it's a novelty or the latest fabric trend, I also do away with it. I only tend to keep fabrics that are "timeless," you know those that can be used in another project without blatantly screaming "I don't belong with this group of fabrics!" I do keep a bag in my sewing studio for fabrics I discard. They are later donated to an organization that make quilts for the less privileged. I stash anything that looks whole. For me, a scrap is a piece of fabric that is cut into and is less than a 1/4 yard. I'm a stasher. I like being able to look in my fabric cabinet and find the perfect colour I need for a quilt. For instance, I needed a binding for this quilt! The perfect green .... and a funky backing .... stash baby! That green must be at least 15 years old! It's just what I needed! A stash keeps me productive by helping me get things done. I've come up with my own formula for stashing. The quantity I purchase is dependent on what I intend to do with it. When I work with reproductions, the quilts tend to be scrappy, so I usually work with 1/3 of a yard. When I need a piece I cut parallel to the selvage and keep the width of the intact! Blenders, depending on the colour, I'll usually get a yard. I'm not much of a blender gal, most of the blenders I have in my stash are bright and cheerful. As for batiks, I always buy minimum 1/2 yard. Most batik quilts work with fat quarters. I can just cut the yardage in half! Are you a stasher? What's your formula? Last summer, I bought a cute train/road panel just because. You really never know when you'll need to quilt one for myself a child. Who wouldn't want to play with theses road and train tracks?! Well, last Sunday that kid came to mind. I took the panel out and began pinning it so that I could use my DSM to machine quilt it. I reasoned, "I'm much better at controlling the quilting with my DSM, as opposed to my longarm." What that really meant was "I'm such a perfectionist chicken, so I better use my DSM". 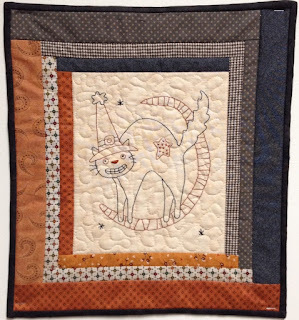 Now don't get me wrong, I do not produce perfect quilts, I try, but I don't succeed. It's really a matter of what I am willing to live with and, as I get older, I seem to be more and more tolerant of my imperfections work. As I started to safety pin the top, this voice in the back of my head said "Come on Carole, when are you going to be daring and just do it using Penelope?". Hum ..... so I took the safety pins out and began loading it on my longarm. I nearly had a cardiac arrest! "Oh no, this isn't good". But, I decided to take this as a learning experience and did not take it out. I continued machine quilting the quilt. Yes, there are some spots where I'm not following the line but, in the grand scheme of things, it's really not noticeable unless I point it out. Sometimes you just gotta do it, let it go and get it over with! No roads are perfect, and I'm sure once my the child has the trains, cars and whatever on the panel, it really will not be noticeable! I learned a lot from this simple panel. Let it go Carole .... and just do it! Last night, I decided to make something that's been on my "to do" list for quite some time (we're talking quite a few years now). You see, I have this stash of cute kid fabrics that I've been hording accumulating and .... I just couldn't bare to part with ..... that is .... until last night! The top fabric is a favourite of mine - Marvel Avengers, which Fibre carries. Yea, it was an impulse buy! The other two are from my personal kiddy stash! Let me tell you, they are addictive! I actually made five (5) pillow cases last night!!!!! Visuals are always good, so I checked out Randa's (Prairie Quilts) YouTube tutorial video. 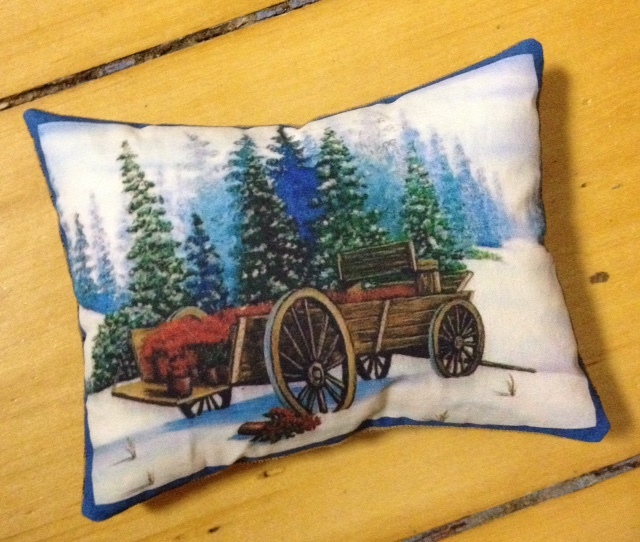 What a great stash buster these pillow cases are ... and they make a perfect gift! The ones in the picture are for three special kids! I do hope they'll like them! Do any of you have a happy shelf? Some might view it as an accumulation of "stuff" but I like to think of it as a happy place. Whatever is on it ... makes me happy! Here is my happy shelf, well a corner of it! Anyway, the reason why I'm showing you this corner is because there are items there from special quilter and friends. 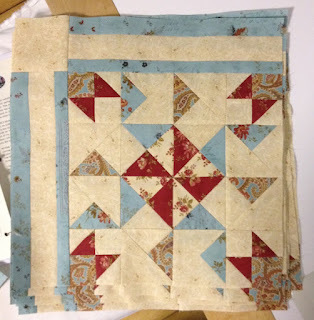 One quilter/blogger in particular always thinks of me during the Christmas holidays. That special person is Debbie from Woolensails and .... I neglected to show you the beautiful items she made for me last December. I just love the way she makes her items look aged! Debbie does such beautiful work. For the past couple of years, she also included a nice balsam smelling pillow! 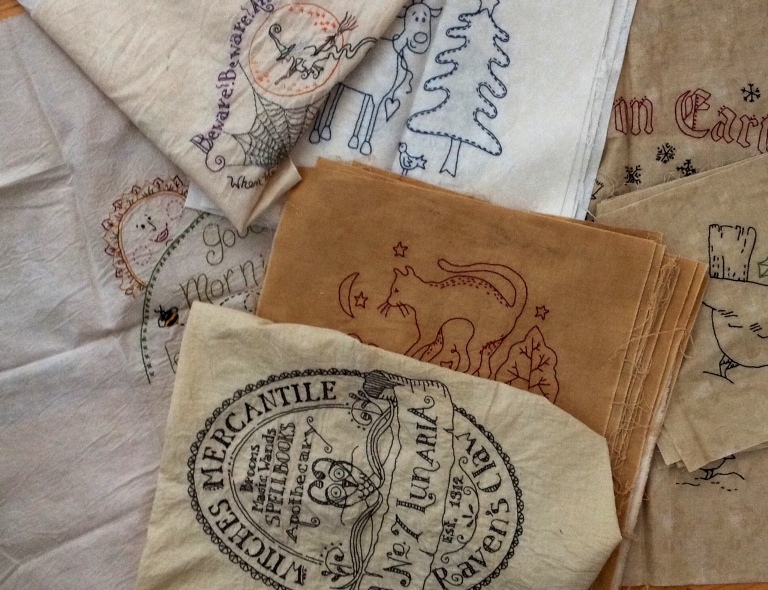 I have quite a few lying around my sewing studio! They smell so fresh! Thank you again Debbie for your friendship. I've met some wonderful people via cyberspace and fostered some special friendships. Blogging has been good for me. I think part of my funk had to do with so many UFOs lying around. All of these hand embroidered blocks ... not pieced .... just waiting ..... and waiting while I start another hand embroider project. This is just a fraction of what is completed. In that pile you have the squares for a couple of bed size quilts! Some, are small quilts a couple are much larger. I decided to take Wendy's advice and just complete something. 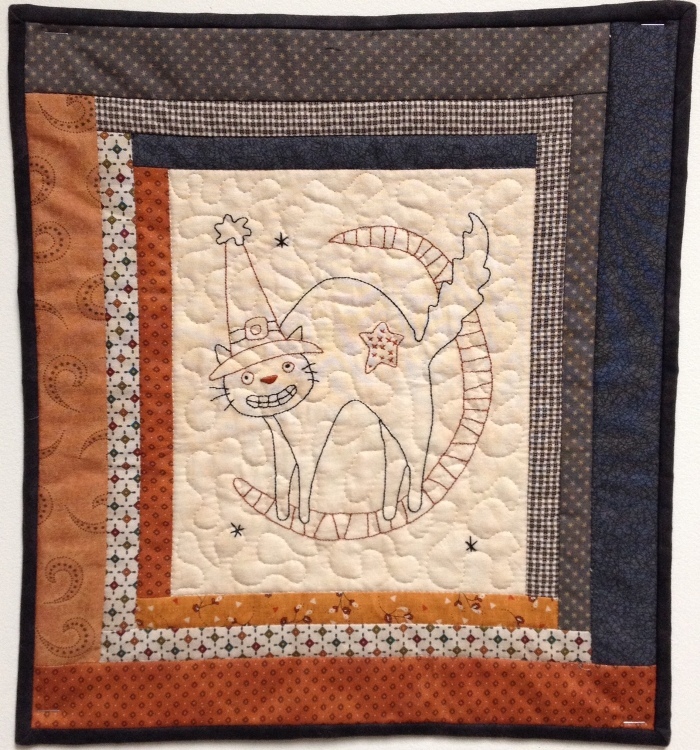 I finished the Black Cat on Moon wall hanging. Used all scraps to complete this little quilt! It's a nice feeling when you don't have to cut into yardage for such small piece! Off to complete another project! Catch you later!